When I think of Iceland, I think of glaciers and volcanoes; that's exactly what I saw when we visited Jokulsarlon glacier lagoon. Jökulsárlón has been a setting for four Hollywood movies -- A View to a Kill, Die Another Day, Tomb Raider and Batman Begins -- in addition to the reality-TV series Amazing Race. For me, this is absolutely one of Iceland's most spectacular sights and a must see for any traveler. We took a tour boat to have a closer look at the floating icebergs and gaze at the Vatnajökull ice cap. It's quite hypnotic watching the icebergs float and the scenery is constantly changing because the icebergs are constantly moving. Even in a country well known for its astounding natural beauty, Jökulsárlón stands out. The combination of majestic floating icebergs, the giant icy blue lagoon, the contrasting black of the sandy shore and the soaring dome of the nearby Vatnajökull ice cap is so breathtaking, it hardly seems real. It’s no wonder this amazing lagoon is one of Iceland's most popular natural wonders. 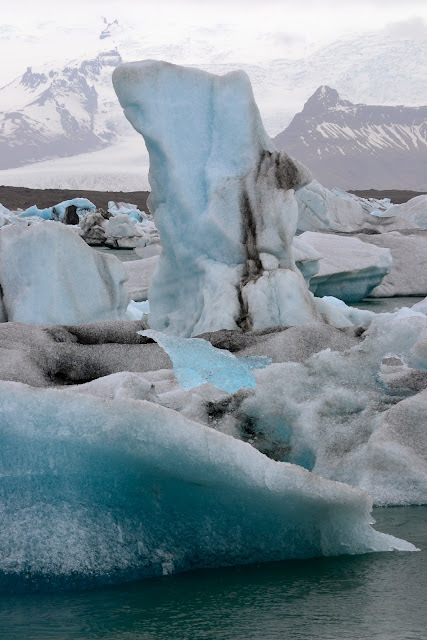 Jökulsárlón's hypnotic beauty draws tourists, photographers and film crews alike to its shores. It has been featured in advertisements, movies, and even on a postage stamp – not to mention, of course, countless computer wallpapers across the world. The black dirt on the icebergs were known to be from a volcanic eruption thousand of years ago. An iceberg is a history book - every single ash and every single trapped insect is a page waiting to be read. My troubles ceased as I gazed at this staggering beauty. This is most definitely one of the most beautiful places I've ever been. Our boat guide clutching a piece of ice that chipped from on of the icebergs. We tasted a piece of that ice and it tasted sweet. A perfect way to cool off as we were already freezing in negative temperatures. If I remember it right it was -15 degrees when we were there. Out of this world scenery. incredible scenery. you said it right, nature at its best. Kayni, you are so lucky! Those photos are so beautiful :D So surreal! oh my, awesome pics! awesome traveler! thank you very much Kayni! Stunning. Simply WOW! I would love to visit that but with -15 degree? Uhm, can I pass please? LOL! BUt seriously, that's really a mesmerizing sight. Thanks for sharing your pics.